Shephard regains consciousness inside a V-22 Osprey, confronted by the mysterious G-Man. As the G-Man talks to Shephard a white flash occurs in the distance, indicating that Black Mesa has been destroyed by the nuclear warhead. The G-Man then informs Shephard that he will be detained “in a place where you can do no possible harm, and where no harm can come to you.” He explains this is done since Shephard reminds him of himself, but is still a dangerous witness. The G-Man walks into a portal, Shephard is detained and the end credits roll. Easter egg: If the player uses a console command to view the skybox from within the V-22 Osprey during the G-Man sequence, there is a hidden message on the upper skybox texture. The message reads: “HACK HACK HACK ALL DAY LONG. HACK HACK HACK WHILE I SING THIS SONG [sic].” This poem is a reference to Adam Sandler’s song, The Beating of a High School Janitor. This can also be found by viewing the game files. It probably references to the fact that the developer used hack to make the skybox look like it was changed by rotating the camera while not changing the textures themselves. Did you enter the secret room with 2 armour charges? Get inside the airlock below the wind shaft. Catch a glimpse of the Geneworm on Xen. I admit to being a little apprehensive about this level. I dislike the final level in HL and I remembered disliking this one and this replay was no different. I find Boss levels too predictable and repetitive. I much prefer multi-enemy situations with plenty of tactical and gameplay variation. The pre-boss section was much more fun for me. Still, the geneworm thing itself was pretty cool and the whole effect was really well done, it just didn’t float my boat. Your nautical mileage my vary. So, that’s another full game in the bag. 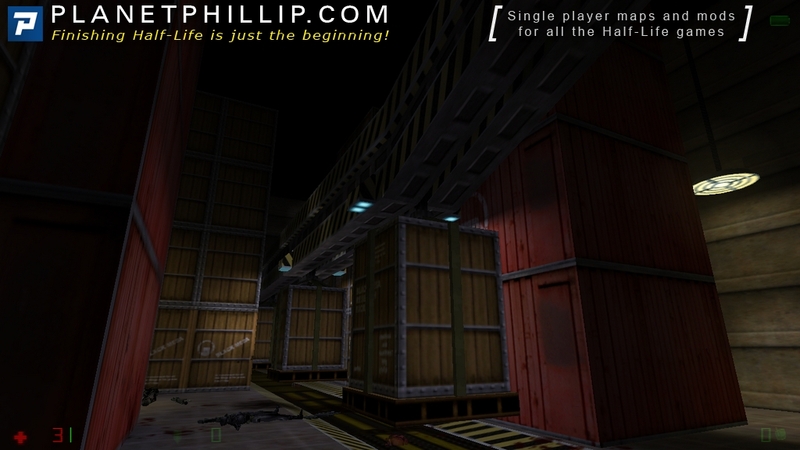 I felt this was a great sequel to Half-Life and I don’t have any probable with Race X being canon or not. Whose to say that some portals didn’t just reach their world and Adrian got the brunt of the action? Looking forward to Blue Shift next, although it may have to wait until December, as we have something new starting next week. DOH! Of course, in the helicopter. Nope, I always rushed through that section. I need to take my time with it. – Get inside the airlock below the wind shaft. – Catch a glimpse of the Geneworm on Xen. The end of OpFor is also notable for having the only scene consider “canon” by Valve in Gearbox timeline : Black Mesa being nuked. Other than that, Geneworm was a bit of disappointment compared to Nihilanth, as there is practically no reason for its existence, it is mute, and the only background is “your marine friends went there and they didn’t returned”, oh great. We don’t even know if it is the Race X leader, what it wants, etc… It was explained later by Gearbox as a sort of giant factory harvesting planet resources… Oh well. Of course, having the Geneworm was 100x times better than Blue Shi(f)t (sorry) ending, with no boss enemy (this will be changed in Guard Duty, the Source fan-made remake). The epic conclusion to my long playthru of OP4 is finally here! I always wondered why that guard says this storage room is ‘the only way out” when in fact the only exit is a giant portal to Ye Olde Race X Town. But usually when I get to the parking garage from the previous chapter I get this feeling of foreboding knowing that I won’t be able to escape from Black Mesa after all. The path forward leads not to a way out, but to a dead end where a giant worm awaits you, and you must do laser eye surgery on it. Maybe Shephard should have become a doctor. Hmm. Doctor Shephard. Reminds me of a murder mystery book. This chapter start in a purely BM like style. You must get across a warehouse and fight Black Ops. Add some jumping/moving sequences and a final battles between humans and aliens. Then Barney shows you your next objective: go down a deadly place in hope to return alive! The Boss map is a bit strange. First you don’t know what is the Gene Worm, Race X master? A guardian ? The only thing I notice is that nose reminding Tentacles. No matter you must defeat it with providential lasers guns. 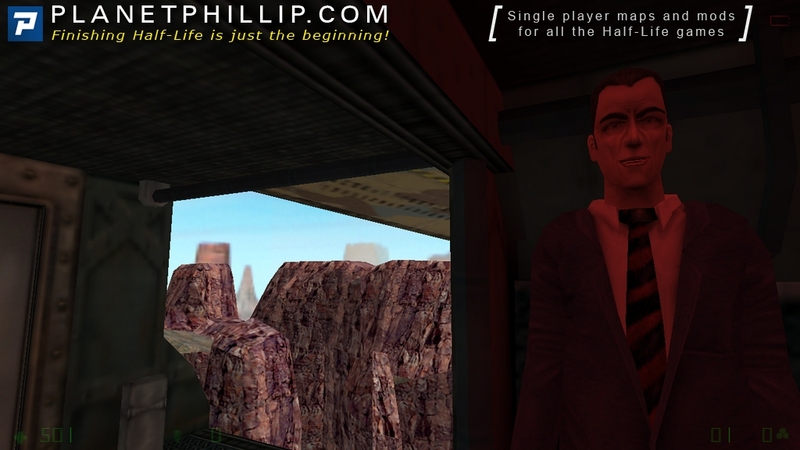 After your victory, the G-Man meets you and reveal that Black-Mesa was a little thing in a bigger plan. Because he have respect for Shephard he keep him alive but prisoner. 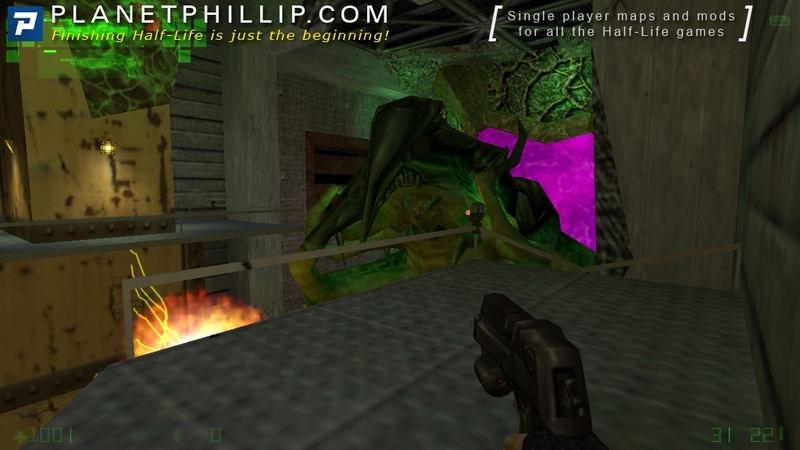 Definitely Opposing Force is the HL episode I most dislike. Not that the game is bad but is weird, seems experimental in some way. You have no clear objective but survive, others always changing, but it must be the identity of that game. It is also more difficult and, in my opinion, I prefer entertaining aspect of a game than pure challenge. In fact I prefer Blue Shift. 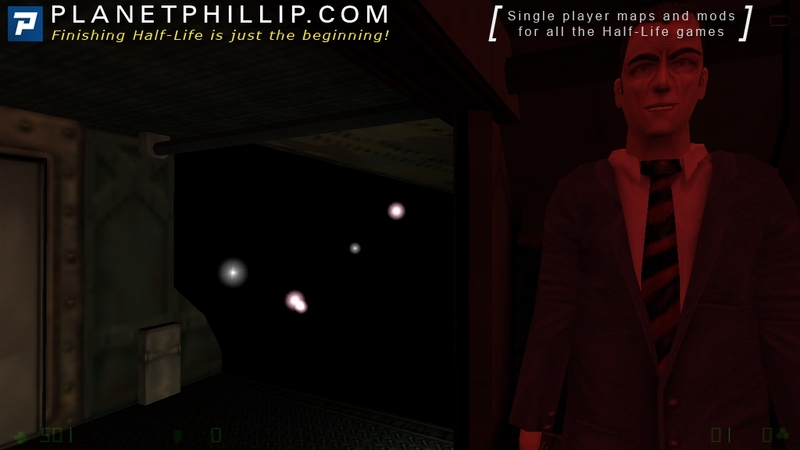 OK it’s too short and have no real novelties, but it’s more close to HL1 gameplay. Yes, was easy to found. Get inside the airlock below the wind shaft. The same described in the poll, isn’t it? How can you miss him ? Well, I mean my ears. Why a so noisy conveyor ? And that rope ? 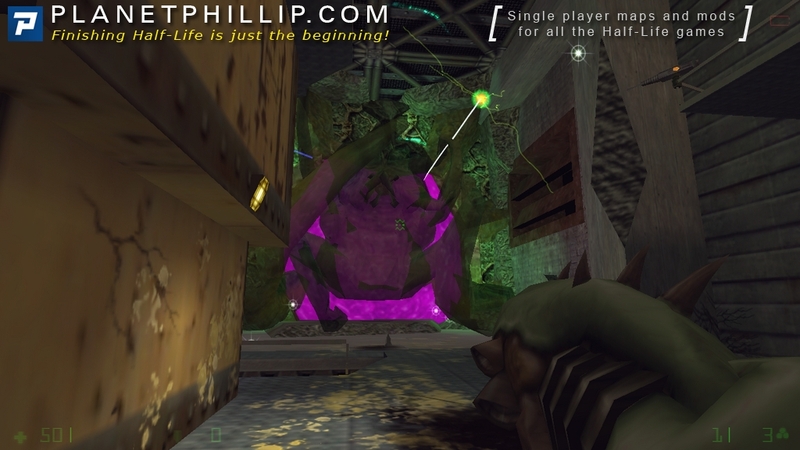 When starting this chapter I thought to myself, “wasn’t there a warehouse segment in Opposing Force or was that Blue Shift?” My question got answered 10 seconds later, but for some reason I’d thought that the final chapter contained nothing more than the boss fight. The boss fight provided no challenge what-so-ever thanks to the healing pool. But none the less a repetitive rather uninteresting boss fight. And so much like Gordon, Shephard is recruited and put into stasis; but unlike Gordon will he ever be woken up? We get below to underground storage and there’s a very intense fight with black ops soldiers and ninjas. Eventually I found a chaingunner. Lucky RPG shot – and there’s no chaingunner anymore. Then we have to go through moving crates. The sound of their movement is way too loud. I died a lot there due to lack of medkits and batteries. 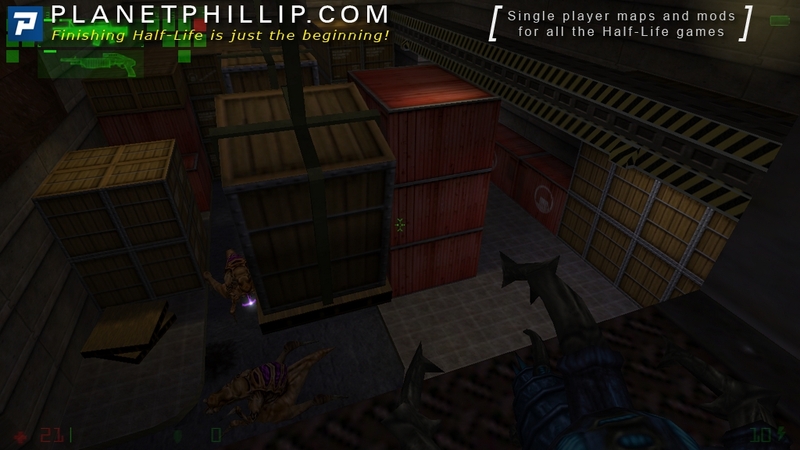 Then there’s a nice fight when we jump on top of crates and destroy the enemies which are below. The door opens, and Barney warns us about something coming through. We take weapons and ammo, and get even deeper underground on the next elevator. 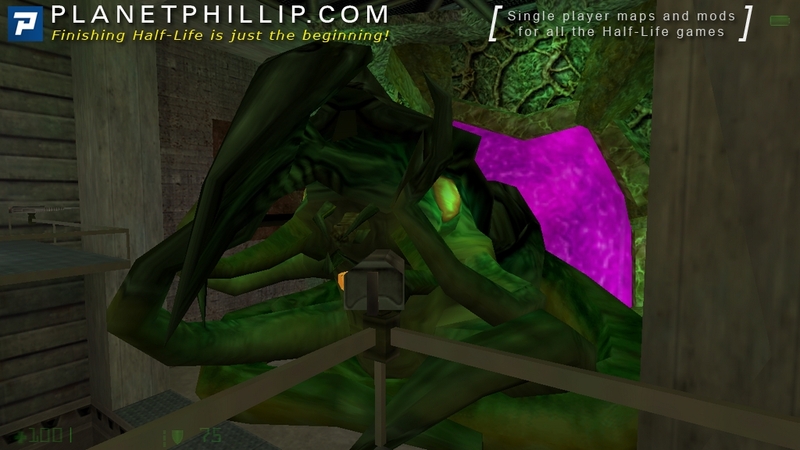 The place is infested with Xen growth, and then we encounter a portal with big monster coming out of it. The boss’s weak points are obvious, so we hit it where it hurts, using nearby healing puddle and laser guns. The boss sometimes teleports creature X in to stop us. Finally, there’s a spectacular sequence where the boss is retreating back to portal. The G-Man finally meets us and puts Shepard in stasis. Hopefully, Shepard’s return will happen sometime in the future. Has anyone else ever particularly noticed the evil, ominous machine noise that you can hear in several places in this chapter, such as the “wind tunnel” area? What exactly is making that noise? I don’t know, but I’ve always thought it was superbly cool and scary. In fact, I always think “they should’ve used that sound effect from OpForce” whenever I play another game or see a movie that has some evil, ominous machine in it (like the “scream sucker” machine in Monsters Inc.). Yeah I’m with you on that cool sound. I don’t know what is supposed to be making it, I figured it was machinery gone wrong or some type of alien machinery even. I always think the sound inside the Citadel in Half-Life 2 is very similar. Creepy, rhythmic, and mechanical sounding. 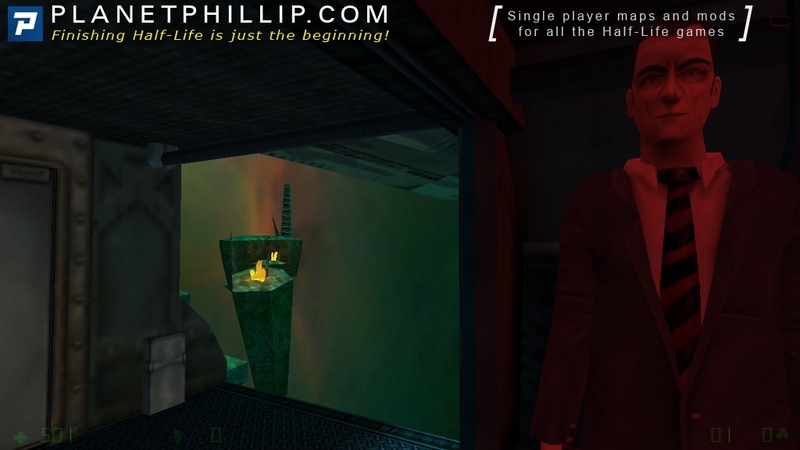 The chapter begins much like any other in the HL1 saga. We find ourselves traversing a warehouse that would be more at home in Raiders of the Lost Ark, swarming with the Black Ops. One wonders what they are still doing here, since the facility (and the world) is literally falling apart around them and there’s probably nobody left to report back to. Any way, before too long we arrive at the inevitable boss battle. I’ll be honest it is really the bare minimum you could expect from the end of a game: shoot these places, kill some enemies, repeat. At least it is less frustrating than the Nihilanth, but I recalled it being more interesting than this. I would say however that the biggest problem is how completely out of the blue this battle is. As players we have no idea what this creature is, where it came from or why we have to kill it. All we get is a random guard pointing us in its direction and saying “Monster bad. You kill monster”. Whilst playing I was thinking about this and decided it was actually one of the problems with the game as a whole. 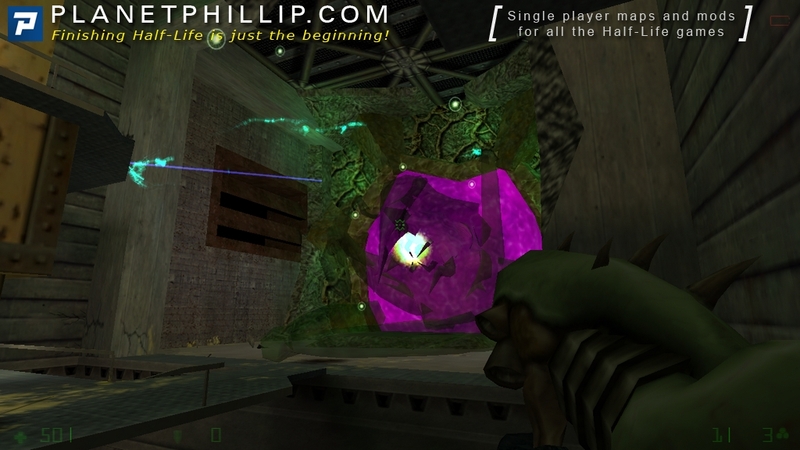 In Half-Life we always had a definite goal, be it reaching the surface or getting to the Lambda complex, with various obstacles placed in our way. 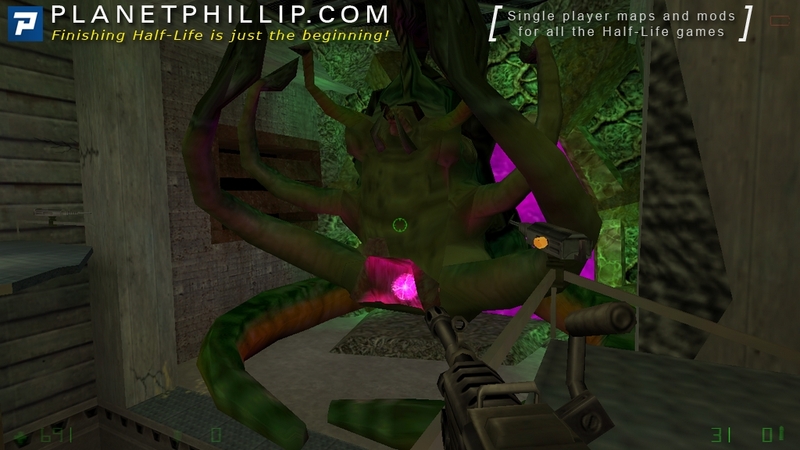 In Opposing Force, what were we trying to achieve? Getting out I suppose, but then what are we doing down here in the basement with Jabba the Hutt’s ugly relative? It seems as if the whole time we have just been going through the motions, exploring the range of different locations just to give Shephard something to do. Having replayed the whole game I think that sums up my opinion. There is a wealth of great gameplay and ideas throughout, it would definitely get a Play It Now rating. 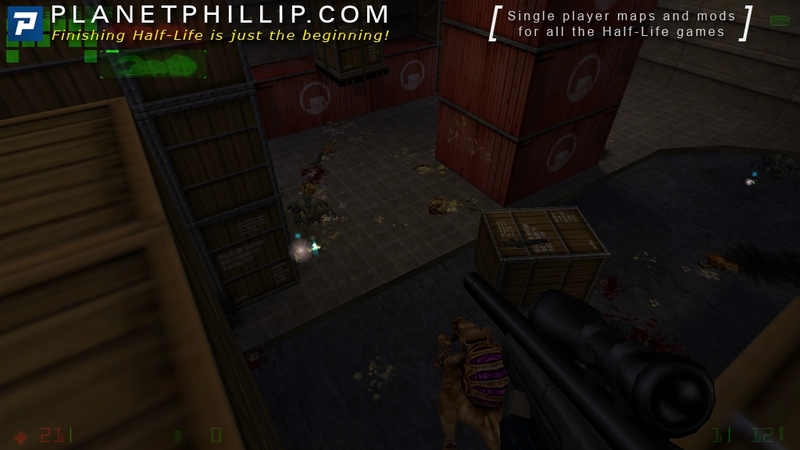 But Opposing Force couldn’t stand up as a game in its own right. 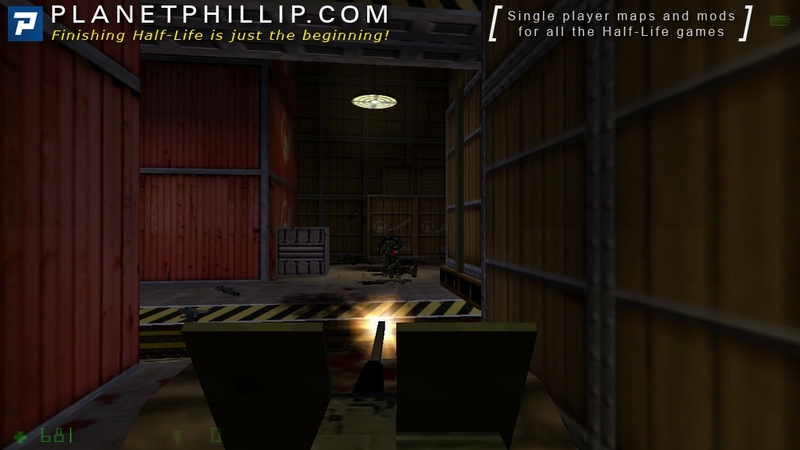 I found the opening battles through the warehouse to be some of the toughest parts so far including all of Half-Life and Opposing Force. A combination of playing on Hard, the great enemy placement, their damn grenades, gravity, and the female assassins” invisibility all combined to make this nearly too frustrating for me to get through. As it stood it was a great challenge. The rest of the chapter, however, was a letdown. I don’t feel the geneworm boss battle is a worthy finale to what is otherwise a fantastic expansion. As mentioned above it is kind of out of the blue and it ends up being more of a puzzle than a boss fight. 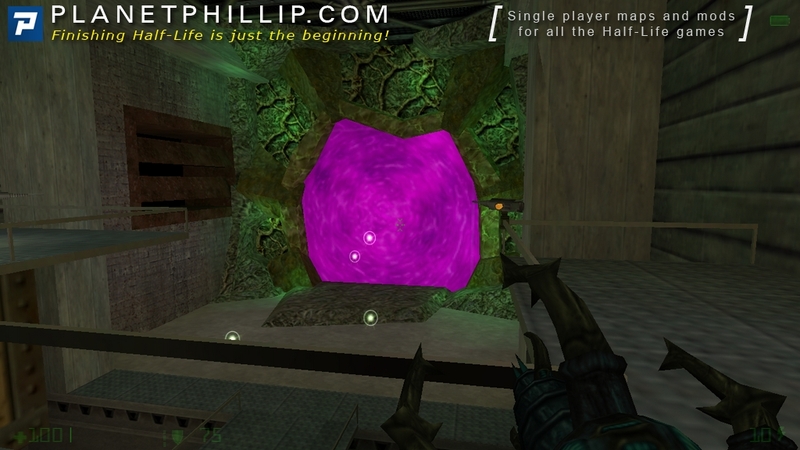 A couple things I really did like about the final battle: 1) the nifty pulsating portal and the way the geneworm arrives, and 2) the way the environment starts to change as the battle goes on – I like how it becomes more difficult for you to get around the place as he starts taking out the catwalks and stuff. In all, a great warehouse assault followed by a bit of a letdown finale. I did again like the deliciously dark ending though even though the GMan’s exposition really doesn’t tell you anything. I’m starting to hate boss fights as well, I spent well over an hour thinking I’m doing something wrong, it can’t just be as repetitive as it seems! But I guess it can.. I got the first challenge, idk how I can get the 2nd if a trip to Xen took 60 ammo so I was only allowed one and in that one I didn’t find no GreenWorm. Maybe I missed something in the final journey? Gah this ending left me so bitter. In fact it didn’t even end properly, game didn’t even return to main menu after the credits were done. I only noticed the conveniently arranged boxes and barrel for getting into the “secret” room with the two batteries in my last playthrough. This may sound stupid now, but I couldn’t figure how to get back out and had to reload. I kept “using” the door and fired weapons all around. The Quake / Unreal way of activating buttons by bumping into them feels awkward if there is a use key that should take priority. The boss fight seemed too easy. Just as in most previous encounters with strong enemies, such as the Voltigores, and even the Gargantua, the game allows us to take cover and snipe the foes from safety. That is particularly odd in the climax. I felt that the campaign started out at considerable difficulty when ammo was scarce, and we were forced to use the knife or avoid enemies. 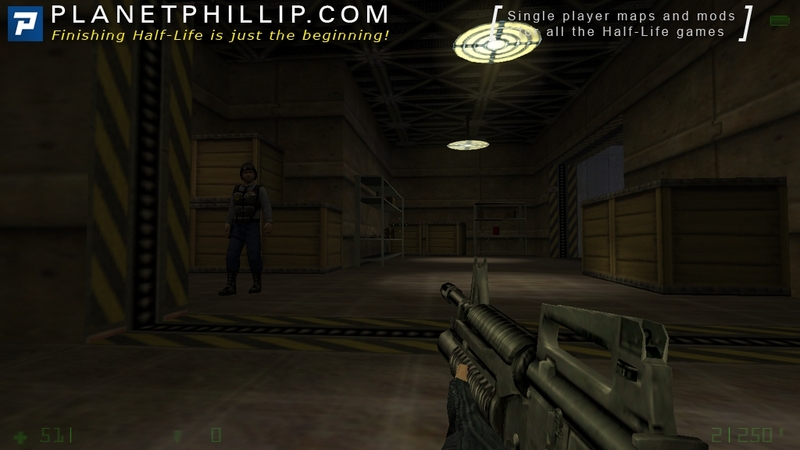 But suddenly turned easy once the player was given the shockroach with infinite ammo and the machine gun. 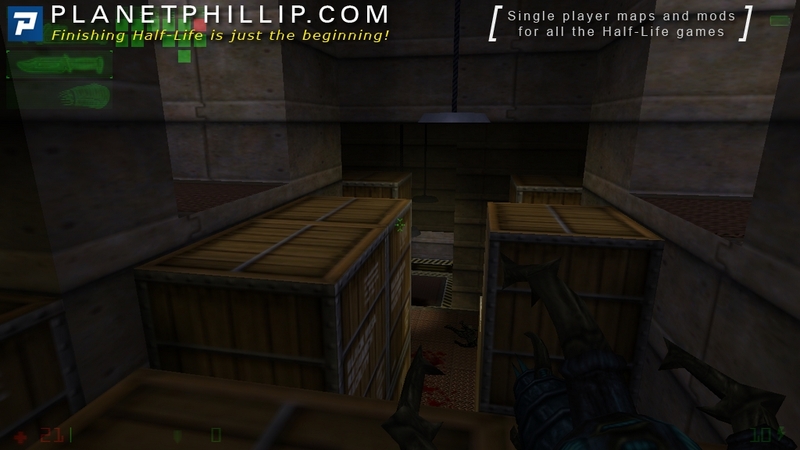 It as if OF is preparing the player for HL2 which was widely regarded as easy, and giving too much aid. The warehouse “staging” area was tough. I powered through it with the machine gun and SMG grenades, which I had too many of toward the end. 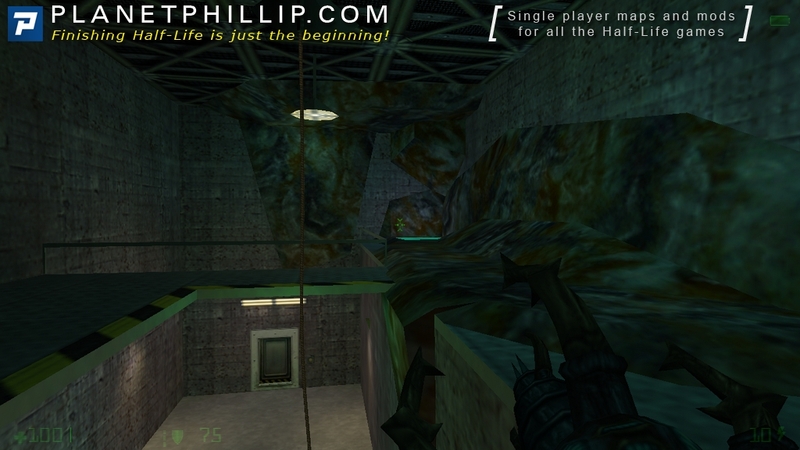 The Voltigore and the black ops in the last room were too easy to take from safety before jumping down. I liked how the screen turned black and silent in the end, illustrating the situation that Shepherd was in. The G-man seemed more powerful and scary, like the goverment.